What Will Happen To The Sterling By April 12? The GBP/USD has been rising significantly since the beginning of this year. However, I see limited further upside for the pound in the event that a last-minute deal is struck. A significant risk of a 25% decline in the pound remains in the event of a no-deal. My overall view on the GBP/USD is bearish at this point in time. As the time to Brexit has been getting closer, it is interesting that the British pound has in fact been rising. 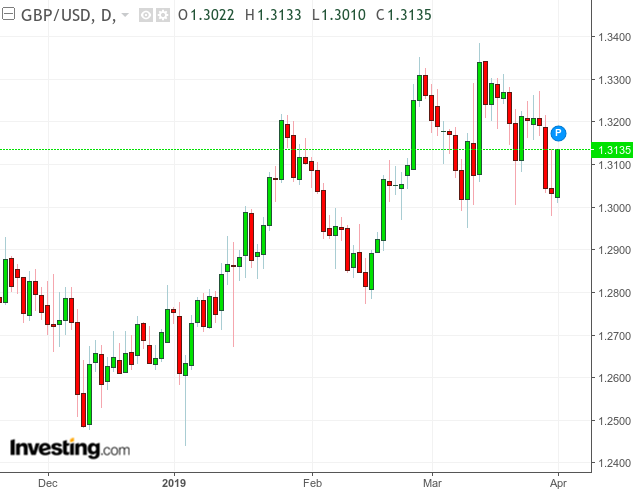 When one takes a look at the daily and weekly charts, we see that the GBP/USD has actually risen above the 1.30 level since the beginning of 2019. Moreover, even with Prime Minster Theresa May’s Brexit proposal having been rejected three times, and the prospect of a no-deal deemed “a likely scenario” by the European Commission, the GBP has still held on to much of its gains this year. In this regard, what can we expect to happen going forward? Previously, it was speculated that the pound could fall by 25% in a disorderly Brexit scenario. Under such a scenario, it is likely that the Bank of England would need to raise interest rates, in order to counter the significant rise in inflation that would accompany a drop in the pound. However, let’s compare the downside with the potential upside. By and large, sterling has been rising on speculation that no-deal is ultimately unlikely. For instance, JPMorgan (JPM) recently reported that the more likely scenario to a no-deal Brexit is a general election – in light of the Prime Minister’s proposals having been rejected. Therefore, I do not particularly see a situation where agreement of a deal would push the pound significantly higher from its current level – much less above the pre-Brexit level of 1.45. While the GBP/USD has made significant gains in 2019, it looks like the currency may have had its run for now. That said, while it is highly likely the United Kingdom would continue to seek further extensions to Article 50 if necessary, a growing risk is that the EU decides to deny it outright. The EU has only allowed an extension up until April 12 in the event of a deal rejection by Parliament which has now come to pass. Moreover, with the European Commission President Jean-Claude Juncker having recently warned that “patience is running out” with Britain, there is the possibility that the EU may simply decide to let Britain leave without a deal at this point. If this were to happen, then this would very likely lead to a significant fall in the pound. 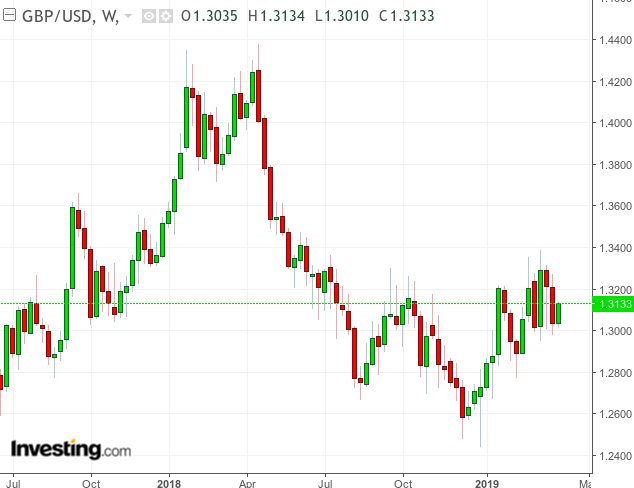 It is important to consider specifically why a no-deal would place downward pressure on the pound. Under a no-deal scenario, the Bank of England estimates that the UK economy could contract by up to 5 percent - which would be nearly the same level as that seen during the 2009 financial crisis. Moreover, with a large current account deficit, there is the risk that the harm in trade as a result of no-deal Brexit would lead to less investor interest in UK assets, including the pound. As a result, the currency would drop accordingly. Additionally, the introduction of tariffs would make British goods more expensive, and this would necessitate a weaker pound for Britain's export market to remain competitive. As concerns matters on the other side of the pond, the greenback could also come under some downward pressure over the coming month. Specifically, U.S. inflation is indicated to have dipped to an 11-month low, and this could mean the Federal Reserve chooses not to hike rates further this year. Ultimately, I foresee that while there may be some weakness in the dollar that might give the British pound some relief, the GBP/USD is likely to trade in a stationary pattern for the time being - with the exception of a "hard Brexit" proving to be an eventuality on April 12. As it stands, the choice appears to be between a no-deal Brexit with a sharp fall in the pound, versus a softer Brexit or extended set of negotiations, where further gains in the pound are not very likely. In spite of the rise, I still see a significant risk of downside for the pound against the dollar and take a bearish view on GBP/USD at this point in time.